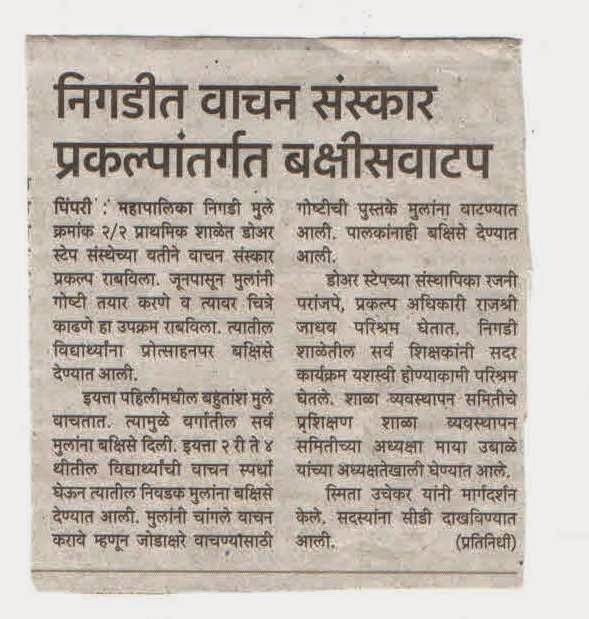 Door Step School's initiatives at the PCMC school in Nigdi under "Project Grow with Books" was covered in the Lokmat Newspaper dated 27th March 2015. Children who contributed stories to the 'One Page Stories' book recently published by Door Step Schools were felicitated. Most children of this school in Standard 1 can read composite letters in Marathi, which is the expected level for this class and they were given prizes too. Children who performed well in Reading Competition for standards 2nd to 4th were given books to recognize their efforts and to encourage their reading habit. The School staff participated wholeheartedly to make the program a success. Shivaji Rathod is a student of 3rd std. from Golwalkar - E&Y CLC (Community Learning Center). He was a very naughty and mischievous boy when he started attending DSS class. He came along with his sister. His language was rude and rough, with other children and with teachers, too. The teacher observed his behaviour and tried to find out the reasons. When asked about his daily routine, Shivaji told the teacher that both of his parents leave for work in the morning to return late in the evening. When they are back, they are so tired that they cannot bear their own children's noise. Hence, Shivaji and his sister are not allowed to even talk in front of their parents. If they try to speak, the parents shout at them. This situation had led the siblings keep shouting all the day. The teacher understood Shivaji's problem and started involving him in various activities and games. With the feeling of being attended and being cared throughout the day, Shivaji calmed down slowly. Now he actively participates in class activities, and enjoys playing games and drawing pictures. Madhuri Sonawane is a DSS teacher at the site class on Windsor Park construction site. She used to sing songs for the children and taught them some actions based on the lyrics. The children would sit and listen to her and then stand up to follow her actions. After few days, the teacher would sit and sing the song, while the children stood and start making the actions. If you visit this site class today, you will find that as soon as the teacher starts with first line of the song, the Nursery children start singing and Creche children start making actions, on their own! Everyday, one of the DSS teachers conducts morning prayers for children at site class on Swadesh construction site. The prayer ends with 'Jai Hind' followed by 'Jai Maharashtra'. The labourer families on this site are from Chattisgarh state. As soon as the teacher says 'Jai Hind, Jai Maharashtra', a boy named Bhupendra says 'Jai Hind, Jai Chattisgarh'! 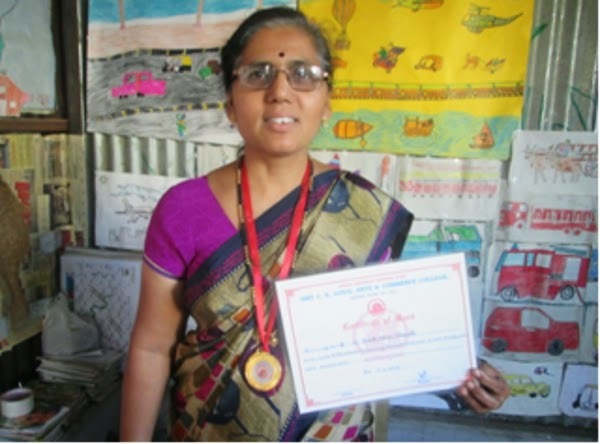 Jyoti Lungare is attending DSS classes from nursery (Balwadi). She is studying in 8th std. now. Jyoti has learned English and Mathematics from the volunteer who came to the DSS class at SumaShilp site. She speaks English very well, and participates in all activities in the class. All the volunteers like her for this. One day, there were visitors at this site. Jyoti gave information about the class in English. Her mother was present there. Jyoti told the visitors about the work her mother did and about her father, too. Seeing her daughter speak fluently in English made Jyoti's mother overcome with joy. Uma Wagh has been working with DSS since four years. She has completed B.A. and conducts the Study Class and Reference Library at DSS. She works as a mobile teacher. She conducts the morning prayers and tells children stories with morals, conducts exercises, spells shlokas and values. She has taught the children to draw rangolis and mehendi. She has taught them small experiments in science. While doing this, Uma felt the need to study further. She also did reference work and thought of pursuing her M.A. Now, she has cleared her M.A. with a 1st class and in 1st rank. She has also achieved a gold medal. Door Step School helped Uma to pay her fees for her M.A. She has paid back this amount later. Research confirms a strong link between regular school attendance and learning outcomes ! The field staff of the project ‘Parents’ Participation in Children’s Education’ tries various ways to encourage children in Kondhwa and Mohammadwadi area to attend school regularly. In November, it was announced that all children with 100% attendance each month will be given a prize for that month. This has encouraged all children to attend school regularly with 106 out of 500 children enrolled in mainstream government schools attaining 100% attendance in November and 156 in December! They are felicitated each month in front of all the other children and given a small token of appreciation by their teachers or our field staff. This has encouraged both children and their parents to be more conscious of regular attendance at schools. As a result there has been an overall increase in the attendance of all children. Of the 487 children who attend school regularly in these 2 areas, 294 children now have more than 80% attendance!